As specialists in the field of 2-4 unit properties, we are seeing a growing trend of Millennials seeking a duplex, triplex, or fourplex property as their first home instead of a single family home. It makes much more financial sense, so we are not surprised at all. However, there are many hurdles to overcome when buying your first home, whether you are a Millennial or not. 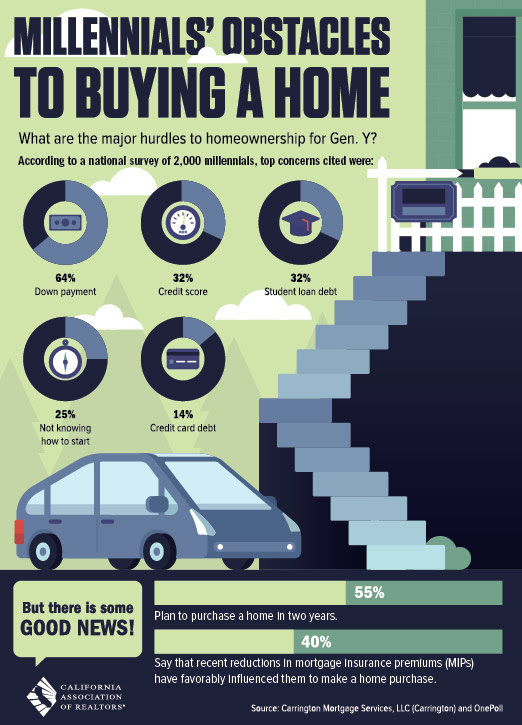 The graphic below is a general illustration of the common concerns many Millennials face when considering buying a home. With all buyers, our first recommendation is always to seek a preapproval with one of our preferred lenders who have a successful history of lending on 2-4 units. These lenders can assess your situation and either issue you a preapproval right away or prescribe various remedies to get you ready for your first 2-4 unit property. After one of our preferred lenders gets you preapproved, we then move on to the property search, but the first step is always the preapproval for a loan. Whether you’re ready for your preapproval or if you’re uncertain about your financial situation, or if you just want to learn how you can get yourself ready for buying in the future, call us today for a free consultation and we can get you started in the right direction!